Norwich City boss Neil Adams has apologised to Ipswich Town manager Mick McCarthy for forgetting to shake hands after his side's derby win. 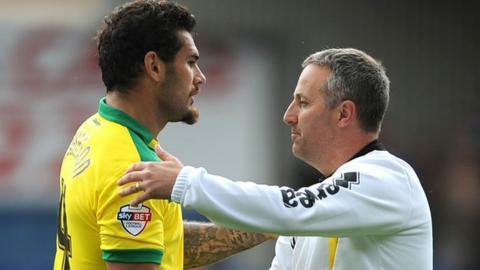 Adams celebrated Norwich's 1-0 victory at Portman Road without acknowledging McCarthy or his assistant Terry Connor. "I want to apologise to Mick and Terry. I was out of order. It was completely unintentional," he said. McCarthy said: "He should have shaken my hand. I deal with matters with other managers individually and on my own." Adams, 48, took charge of City's final five Premier League games last season as they suffered relegation, and this victory in the first East Anglian derby for three years was only his ninth game as a manager. His side held on to the first-half lead given to them by Lewis Grabban's header and the former youth-team coach rushed over to the travelling supporters after the final whistle. "I can tell them hand on heart it was definitely not intentional. I wouldn't have been happy if it was flipped. Mick and Terry are good people and I apologise unreservedly," Adams added. "I was too caught up in the moment. I should have shown more respect and shook their hands before celebrating." Former Republic of Ireland and Wolves boss McCarthy said he would have not brought up the issue had Adams not done so, but suggested it may have been a "lesson in etiquette" for the young manager. He said: "The first thing to do is shake hands with me and TC. I've had to do if after being beaten by six and five. It's what you do. If that's a lesson today then fine."